Sweet Amanda did one thing in the last two homes she lived in… she painted her kitchen walls purple. By purple I mean dark eggplant colored purple. Baby Boy even helped with the painting but I think that secretly he is a little thrilled that the apartment they are living in cannot be painted. Even though Baby Boy may not be thrilled with purple, I am. It is my favorite! I wanted Amanda to have her beloved purple in the kitchen area. I turned to Pinterest for inspiration. More frames on the wall. I remembered that over the years I had accumulated a lot of frames. I just can’t seem to throw out an old frame. 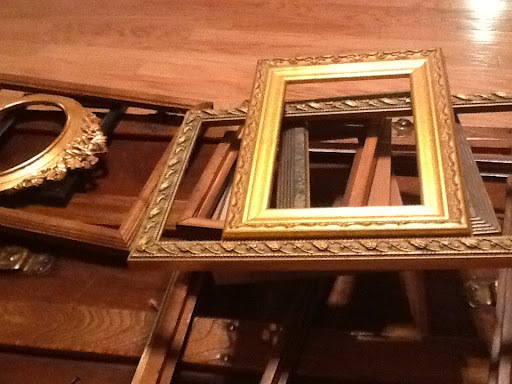 I even pick up frames that I love when out garage sale shopping … even if I have no idea what to do with them. They have stacked up in the garage. Hubby refers to my stuff as my hoarding and he may be right, but at least I keep it out in the garage. We will add as we find more. We drug those nasty frames from the hoard into the house and removed the glass, backing and everything that wasn’t frame. Hubby and Baby Boy even helped but they didn’t know what we were up to. The frames don’t look to bad. We will post the progress. This project will be totally free and will let Sweet Amanda have some purple in her kitchen.